A week after Lil Pump visited WHRB, a College official allegedly told WHRB that the College would place the organization on administrative probation. 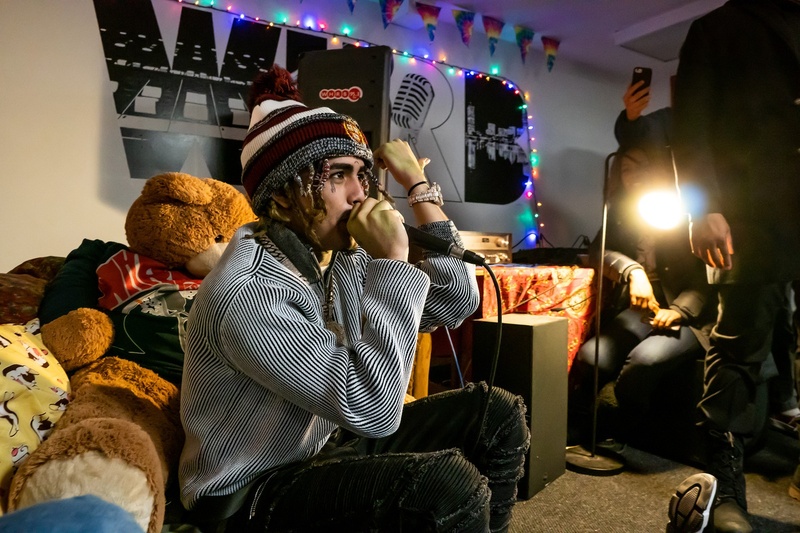 Lil Pump, who is famous for stating, inaccurately, that he dropped out of Harvard College, visited WHRB on Feb. 28 to promote his new album “Harverd Dropout.” At the event, WHRB member Griffin R. Andres ’21 interviewed Lil Pump about his career and attendees browsed the rapper’s merchandise. WHRB President Kiran O. Hampton '20 wrote to the station's undergraduate email list Saturday that the organization "may have been placed on probation" by the College, according to a copy of the email sent to The Crimson by Jensen E. Davis '20, an inactive WHRB member and Crimson magazine editor. Hampton wrote that JonRobert Bagley – the associate dean of student organizations and resources at the Dean of Students Office – verbally notified him that the College placed the radio station on administrative probation shortly after the Lil Pump event. Groups placed on “administrative probation” may temporarily lose the ability to reserve College spaces and recruit new members at Harvard-sponsored events. Though Bagley allegedly “promised to send a formal email to initiate proceedings,” Hampton wrote in his email that administrators never sent such a note. College spokesperson Aaron M. Goldman wrote in a Tuesday email that WHRB is “not currently” on administrative probation. Goldman declined to comment on whether Bagley or other College administrators told WHRB they planned to place the group on probation. He also declined to comment on whether the event that WHRB hosted with Lil Pump violated any College policies. WHRB is a recognized student group at the College, meaning it is subject to College regulations that require it to register certain kinds of club events with the Dean of Students Office. Such events include those with more than 100 anticipated attendees, those at which goods or merchandise are sold, and those at which high-profile guests are in attendance, according to a Dean of Student Office “Recognized Student Organization Resource & Policy Guide” handbook provided to officers of student organizations at a mandatory meeting with College administrators last fall. “Student organizations inviting dignitaries and other high profile individuals should begin to work with the Student Engagement Team prior to extending an invitation,” the handbook reads. Hampton declined to comment on what policies Bagley told him the station violated. The handbook details four possible outcomes “in the event of an allegation that Harvard’s policies have not been followed by members of a recognized student organization”: Warning, Period of Probation, Suspension, and Revocation. The College first put a student organization on “administrative probation” in February 2018. After campus religious group Harvard College Faith and Action asked an assistant Bible course leader to step down from her role after she began dating another woman, administrators announced the group would serve a year-long probation, though the punishment had little practical effect. Last semester, the Dean of Students Office introduced updated disciplinary procedures for student organizations in violation of College policies. In his email, Hampton urged radio affiliates to exercise caution in light of the potential disciplinary measures. —Staff writer Shera S. Avi-Yonah can be reached at shera.avi-yonah@thecrimson.com. Follow her at @saviyonah.